Ms. Delman showing her famous smile. This year we’ve had a bunch of new teachers join the Oceana community. One of our new additions is Spanish and Health teacher, Sara Delman. The 2012-2013 school year is Ms. Delman’s first year teaching. Last year, she served as a student teacher at Jefferson High School. “I actually applied for this job not really expecting or wanting to get the job, but after I interviewed with Ms. Pemberton and Ms. Holland and learned more about what this school is really about, I wanted to work here more than anywhere else,” adds Ms.Delman. However, Ms. Delman didn’t always want to be a teacher. She majored in Spanish but responded with a “No way!” when asked if she was considering entering the teaching field when she was an undergraduate in college. Ms. Delman admits that “I didn’t want to [become a teacher] mostly because I didn’t want to do what everyone expected me to do. Five long years later, I realized that was exactly what I wanted to do”. She was working as an event planner, but felt unfulfilled with that career so she finally turned to teaching. When asked about how she felt teaching two completely different subjects such as Health and Spanish, Ms. Delman responded with “It’s definitely challenging but I actually kind of like it. I love that I get to learn about something new [Health] and get better at teaching something I know [Spanish]”. It takes a lot of work and effort juggling the two subjects but she enjoys the new experience and teaching different levels of students. There are many pros and cons for becoming a teacher. For Ms. Delman, she likes knowing that she is making a difference through educating her students but dislikes having to be “mean” when she needs restore order in her classroom. Ms. Delman collaborated with Ms. Bookwalter in leading the Amazing Race interim this year. She also started up the CSF Club with Ms. Uhrenholt which encourages and helps students to complete more community service. Although she is quite busy, Ms. Delman tries to find time to have fun. She looks forward to hanging out with her friends, watching movies, and especially going on hikes with her dog, Eloise. 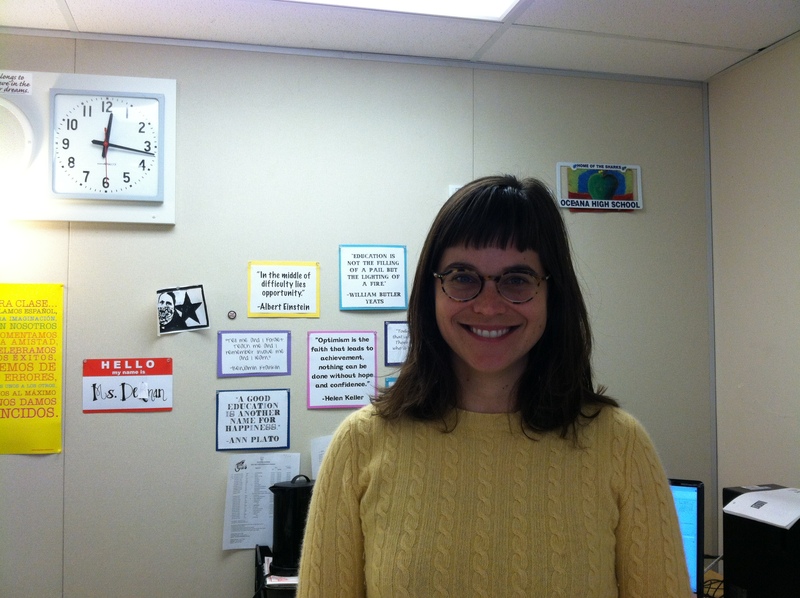 “I’m a huge dork – I love to read and knit,” reveals Ms. Delman. However, she hasn’t had much time to read, knit, or bike (another one of her favorite activities) because of her busy schedule. If you have yet to meet Ms. Delman, make sure to say Hola! You can find her in her classroom located in room 214.